January 5, 2008 - Cloanto, Amiga software developers since 1986, were excited to preview details of Amiga Forever 2008 running without modifications on a One Laptop per Child XO laptop. The new version of Amiga Forever, which is scheduled for imminent release, features several Amiga emulation environments for different platforms (including Windows, Mac and Linux), spanning more than 20 years of history, more than 50 games which are ready to run with a single mouse click, numerous demoscene productions, videos, and much more. Development remains intense on additional features and add-ons, and more surprise announcements are planned for 2008. 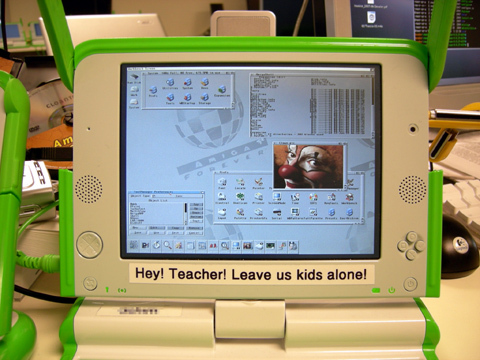 The above configuration requires an OLPC laptop unlocked for USB storage access. Special thanks to our long-time Amiga friend Bernardo Innocenti, now working at OLPC, for his precious contribution and assistance.